Man killed in car crash near Washington Square Mall has multiple stories has to what happened. 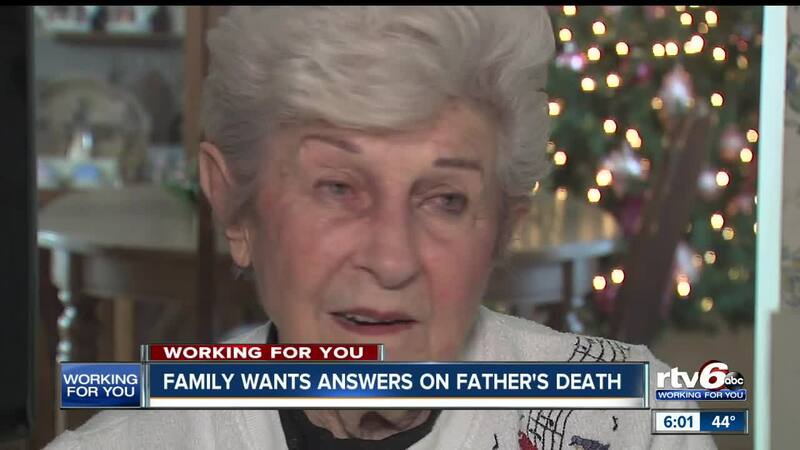 This Indianapolis family is seeking answers. INDIANAPOLIS — This Indianapolis family has been told several different stories on how their father died earlier this month. Now, the family wants answers for how and what happened the night of Jack Fors death. "I come down and see him every morning and tell him goodnight," Dolores Fors, wife of Jack Fors for 66 years, said. " "I just want him back but he won't be back will he." Fors was killed in a car crash near Washington Square Mall. When Dolores and Fors's daughter arrived to the scene, officers told them he was killed in a hit and run. Fors had accidentally driven onto a median. "What he did was turn short when he came around the corner and he ran up on that median," she said. He was standing outside of his car waiting for his wife and AAA to come, when he was hit. Fors's daughter, Cheryl Hadley, said everyone that night told them his death was a hit and run. "The coroner came and visited us, also told us, unfortunately, this is a criminal case," Hadley said. "He was a victim of a hit-and-run driver. We literally heard the same thing from every single person that we spoke with." But, when the family looked at the police report, it mentioned nothing about a driver leaving the scene. The report actually stated that the driver called out for help, for someone to call 911. Police say officers initially believed it was a hit-and-run based on witness statements. Although, while on the scene, a woman told an officer she was the one driving the car that hit him. Detectives then determined this was not a criminal case — and is now being investigated as a fatal accident. The family says none of this information had been relayed to them. They say they have been calling and calling, and haven't even been able to get his death certificate. "There are too many stories and we just would like to know what's going on and where they are," Hadley said. "And I think the woman should be accountable for what happened." The crash happened on December 1, and the family has yet to hear from the police department or the coroners office. The family says, that at this point, they are looking for accountability. Indianapolis Metropolitan police Department says they have shared the family's concerns with accident investigators. And after calling the Marion County Coroner's office, they say that death certificates can take up to 21 business days to complete. The office says it will be signed by Friday.